Headlines today are screaming that screen time is bad for kids. The American Academy of Pediatrics' statement on Media and Young Minds lays out many of the detrimental health and developmental concerns from overuse of screens, including the negative impact on sleep, cognitive and emotional development and temperament. Experts agree that excessive screen time for kids is a problem that needs to be addressed — quickly. Even some of the technologists who created Facebook, Google and other platforms have banded together to create the anti-tech addiction Truth About Tech campaign aimed at 55,000 public schools in the U.S. Meanwhile, activist investors are pressuring Apple and others to implement stronger parental controls to limit kids' screen time. However, there is a key piece missing from this conversation: what's the alternative, especially for kids growing up in under-resourced communities? As a parent of three pre-teen girls, I'm very sympathetic to the impulse to place strict limits on kids' screen time. My wife and I have resisted the temptation — and peer pressure — to let our sixth-grader have a phone. But parental controls only get you so far. Ultimately, as we have seen in other similar national kids' health campaigns, it's not enough simply for adults to try to prevent kids from doing something adults think is harmful. As Scientific American points out, studies found that campaigns and programs such as "Just Say No" and D.A.R.E. did little to combat youth substance use. Some experts believe that engaging with your kids while they're watching TV or on the computer is a possible solution because kids are more likely to be exposed to healthier content and interaction. This "joint screen time" solution, though, assumes that parents have the ability and bandwidth to spend significant time with kids in this way, a particular privilege that may not apply in under-resourced communities where parents spend most of their waking hours working to make ends meet. As our research with behavioral science experts at ideas42 found, precious time together often must be spent doing household chores or running errands with kids in tow. For these families, we need to make it as easy as possible to choose a healthier alternative to screen time — and one that is compelling, free and readily accessible. The pathway to real solutions starts with a better understanding of what kids actually want. KaBOOM! conducted research with Insight Strategy Group and found that outdoor play is among the very few activities that can compete with video games. Although 88% of kids like videogames a lot, outdoor play is extremely close behind at 84%. Even more encouraging, 71% of kids agree that they'd "rather move around than do something in front of a screen" and 73% agree that "zip lines and super slides are more fun than video games." — James Siegal, CEO of KaBOOM! Not only do outdoor play spaces provide all of the benefits of video game play — fostering social interaction and a sense of community, developing collaboration and cooperation skills, offering increasing levels of challenge, inspiring curiosity and creativity and more — they come without the potential risks posed by screen time. 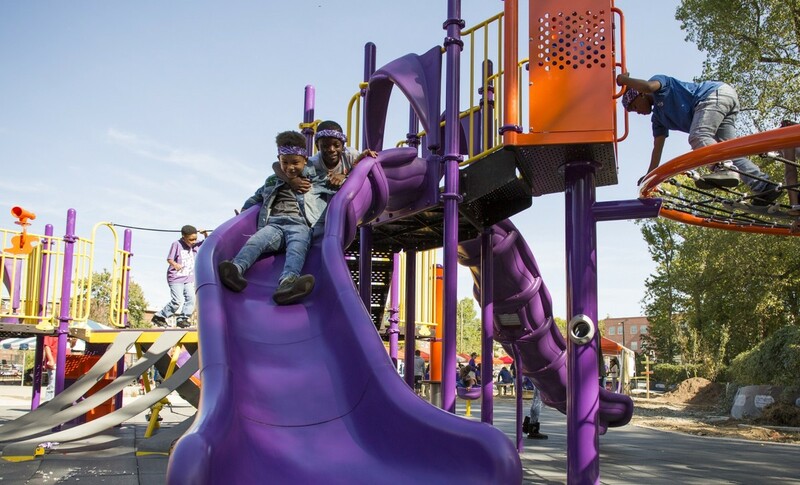 What's more, we have the tools today to ensure that every kid in the U.S. has access to safe, great places to play — whether it's a neighborhood playground, or an everyday space transformed to include opportunities for play. A bus stop doesn't have to be just a waiting area; it can be transformed with swings and creative colors into a place that encourages kids to play where they spend time every day. Sidewalks can become spaces for learning and imaginative play when they're redesigned with kids in mind. It isn't a question of know-how. It's a question of priorities, resources, public will and equity. Parents are already there, with 75% surveyed by Insight Strategy Group saying they "would give up their own personal favorite activity to have a new playground right on their street for their kids." The number jumps to a whopping 86% for families with annual household incomes of less than $50,000. Yet, this desire has not translated into the change we need. For kids in these low-income households, only 51% have adequate places to play in their neighborhoods. Instead of merely trying to convince kids to say no to screens, let's give them something exciting to say yes to — abundant opportunities to play where they live and learn, and all along the way. And let's start with the kids who need it most.